New Rochelle, NY, May 29, 2018 — A case study and subsequent literature review has concluded that absent signs of clinical infection, breastfeeding should continue normally when mother and baby are diagnosed with Red Diaper Syndrome (pink-colored breast milk and pink-colored soiled diapers) caused by Serratia marcescens, an opportunistic bacteria. The study in Breastfeeding Medicine, a peer-reviewed journal from Mary Ann Liebert, Inc., publishers , provides for the first-time guidance as to how primary care physicians and parents can determine appropriate treatment and any impacts on breastfeeding. The article is available free on the Breastfeeding Medicine website. The article entitled, "Serratia marcescens Colonization Causing Pink Breast Milk and Pink Diapers: A Case Report and Literature Review ," is coauthored by Laura Quinn, Elizabeth Matthews, Ann Kellams, Debbie-Ann Shirley from the University of Virginia School of Medicine (Charlottesville, VA) and Melody Ailsworth, Richeson Drive Pediatrics (Lynchburg, VA). The study looked at the case of an 11-week-old infant being treated for fussiness and whose soiled diapers and clothing turned pink. The nursing mother also reported pink nursing pads. Additionally, similar studies involving nine other infants were also reviewed. The authors concluded that there isn't enough evidence to support treatment of the bacteria in otherwise healthy babies and mothers should be reassured that they can continue with breastfeeding in these circumstances. "Knowledge that this bacteria is generally not pathological and clinical judgement should thus be the physician's guide," says Arthur I. Eidelman, MD, Editor-in-Chief of Breastfeeding Medicine. 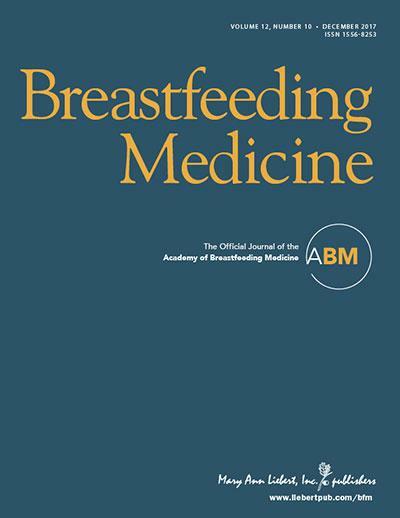 Breastfeeding Medicine the official journal of the Academy of Breastfeeding Medicine, is an authoritative, peer-reviewed, multidisciplinary journal published 10 times per year in print and online. The Journal publishes original scientific papers, reviews, and case studies on a broad spectrum of topics in lactation medicine. It presents evidence-based research advances and explores the immediate and long-term outcomes of breastfeeding, including the epidemiologic, physiologic, and psychological benefits of breastfeeding. Tables of content and a sample issue may be viewed on the Breastfeeding Medicine website. The Academy of Breastfeeding Medicine (http://www.bfmed.org/) is a worldwide organization of medical doctors dedicated to the promotion, protection, and support of breastfeeding. For over 20 years, ABM has been bringing doctors together to provide evidence-based solutions to the challenges facing breastfeeding across the globe. A vast body of research has demonstrated significant nutritional, physiological, and psychological benefits for both mothers and children that last well beyond infancy. But while breastfeeding is the foundation of a lifetime of health and wellbeing, clinical practice lags behind scientific evidence. Mary Ann Liebert, Inc., publishers is a privately held, fully integrated media company known for establishing authoritative peer-reviewed journals in many promising areas of science and biomedical research, including Journal of Women's Health, Childhood Obesity, and Pediatric Allergy, Immunology, and Pulmonology. Its biotechnology trade magazine, GEN (Genetic Engineering & Biotechnology News) was the first in its field and is today the industry's most widely read publication worldwide. A complete list of the firm's 80 journals, books, and newsmagazines is available on the Mary Ann Liebert, Inc., publisher's website .